Planet Mugs 0402 812 748 sales@planetmugs.com.au We have a comprehensive range of branded ceramic mugs, promotional takeaway coffee cups and more. They are all Australia printed and can be delivered to customers in 2 weeks. Being distinct is important if you want to boost brand recognition. Good thing you can rely on these Vienna Printed Travel Mugs printed with your corporate logo or artwork. 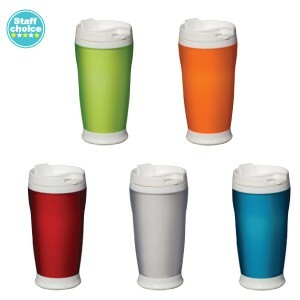 Aside from their vibrant colours, these travel mugs are designed for regular Australian coffee with their 300ml capacity. 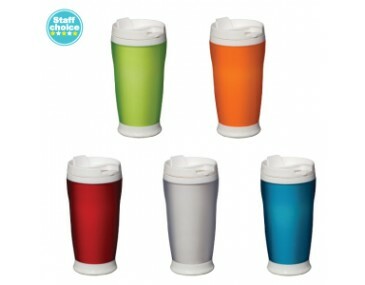 With these branded travel mugs, you know your marketing efforts will be met. Product also features a removable inner cap which is dishwasher-safe. Prices indicated are inclusive of 1 colour printing. For multiple colour printing, contact our sales team to obtain an accurate quote. Colours to choose from include Red, Grey, Blue, Green and Orange. Prices shown are not inclusive of delivery costs and 10% GST. A set-up fee of $75 per colour print will be charged. For superb quality printing, it is recommended that the artwork submitted is in Adobe PDF or EPS format with outlines. Delivery of your orders can be expected within 2 weeks from artwork approval. If you need them earlier, you can inform our sales team and we can make the necessary arrangements. All travel mugs are proudly Australian made.